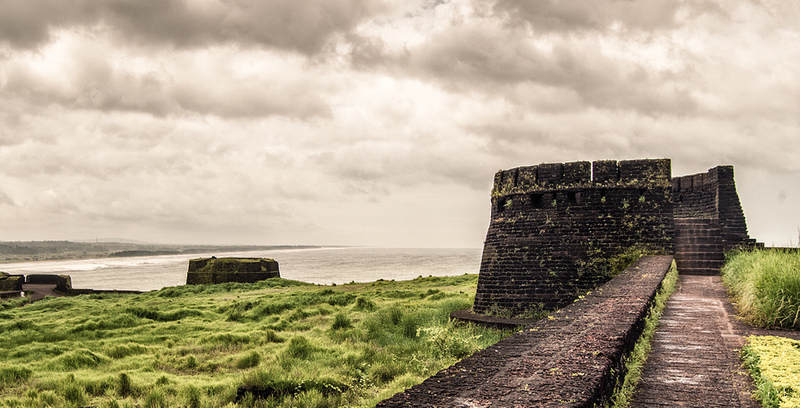 Bekal Fort is the largest fort in Kerala, situated at Pallikkare, Kasaragod district spreading over 40 acres (160,000 m2). Some important features of this fort are the water-tank with its flight of steps, the tunnel opening towards the south, the magazine for keeping ammunition and the broad steps leading to the Observation Tower, which is a rarity. From Bekal Fort, one has an ample view of towns in the vicinity like Kanhangad, Pallikkara, Bekal, Kottikkulam, Uduma etc. 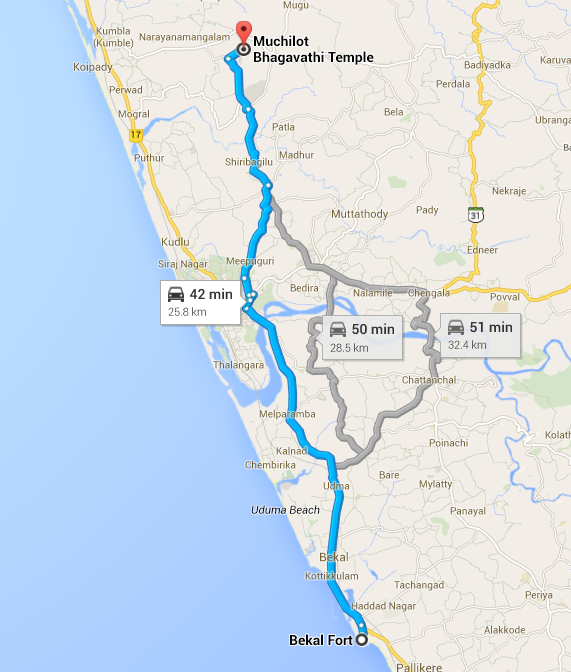 The nearest railway stations are Bekal Fort, Kotikulam, Kanhangad, and Kasargod. This observation center had strategic significance in discovering even the smallest movements of the enemy and ensuring the safety of the Fort. 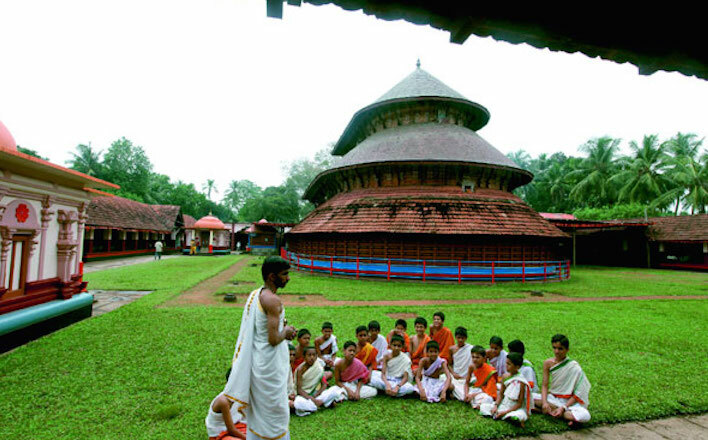 Ananthapura Lake Temple is a Hindu temple located in the middle of a lake in the Kasaragod District of Kerala, South India, at around 6 km from Kumbala. 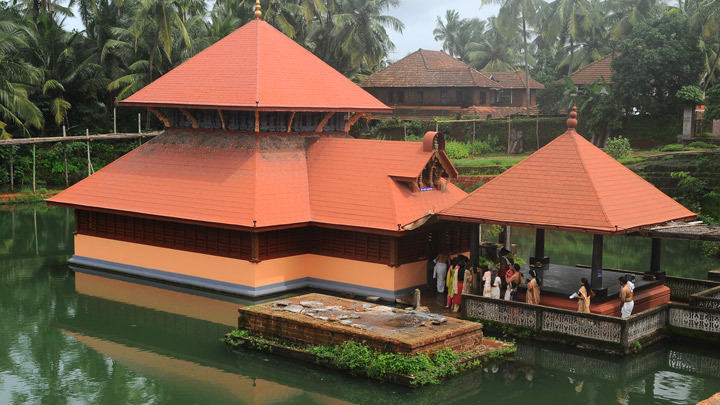 This is the only lake temple in Kerala and is believed to be the original seat (Moolasthana) of Ananthapadmanabha Swami Padmanabhaswamy temple) Thiruvananthapuram. Legend has it that this is the original site where Ananthapadmanabha settled down. The temple's lake is also home to a crocodile named "Babiya", which is supposed to be the guard of the temple. When one dies, another mysteriously takes its place. The Temple lake or tank in which the Sanctum is situated is a large structure measuring 302 feet square (about 2 acres). There is a cave to the right corner of the lake, which has a gate. According to the priests of the temple, god AnanthaPadmanabha went to Thiruvananthapuram through that cave. Hence the names of both the places are a bit similar. Also there is a difference in the God idols places in both the temples. the one in Ananthapuram is standing idol and the other in Thiruvananthapuram is a reclining posture. 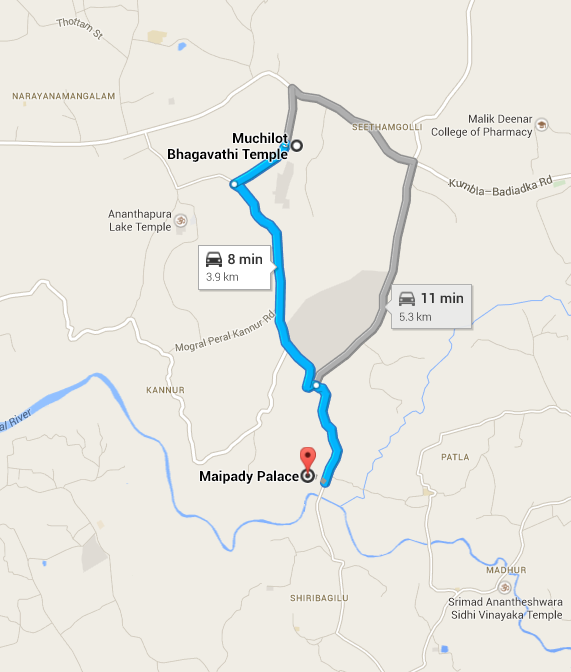 Maipady Palace, imposing edifice is situated on Kasaragod-Perla road, about 8 km from Kasaragod town. The palace was once the seat of the Kumbala Kings. 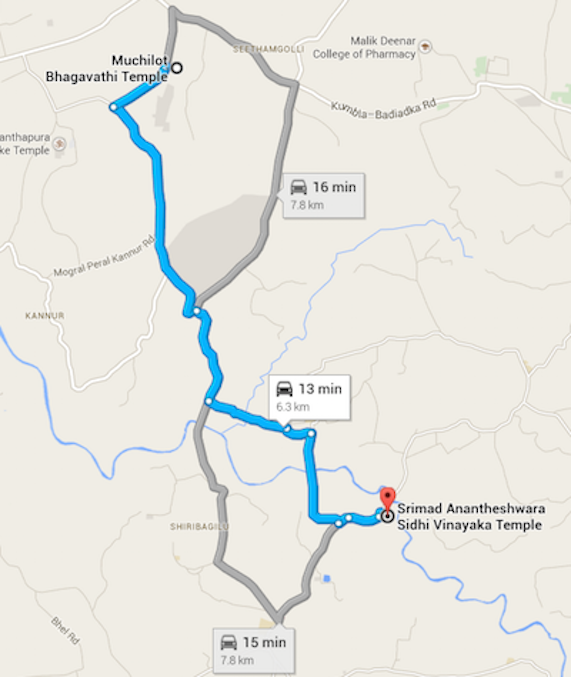 It is 3 km's away from Madhur, Srimad Anantheswara Vinayaka Temple. Kasaragod Railway Station is the nearest railhead. 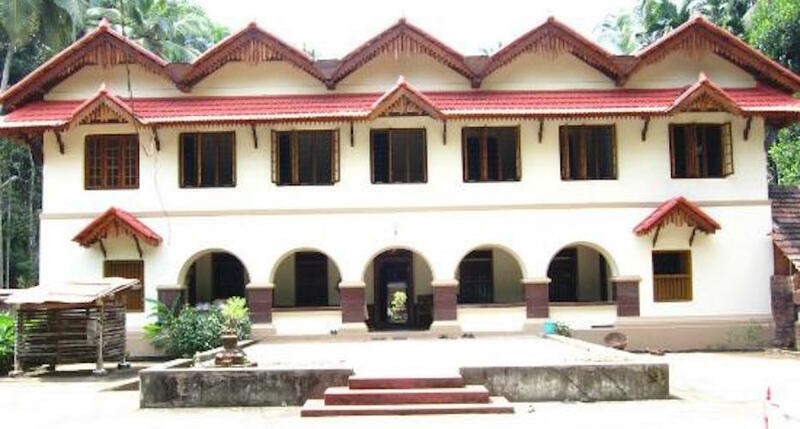 Though dynasties and kingdoms do not exist in the post-independence India, the Maipadi palace in Kasaragod district still remains as a seat of power in the minds of people in the region Maipadi kingdom, which is also known as Kumble Seeme, has the jurisdiction between Manjeshwar in the North and Chandragiri river on the South. Similarly, regions between Adhur on the foothills of Western Ghats and Mogral in the West were covered under the rule of Maipadi kingdom. Travellers will have to reach Kumbla, which is about 35 kilometers from Mangalore, either in bus or train. 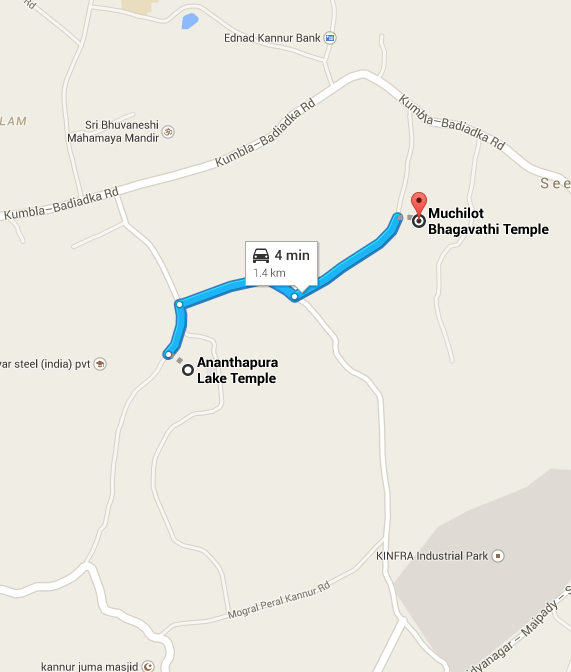 Later, can catch a bus to reach Seethangoli via Naikapu. 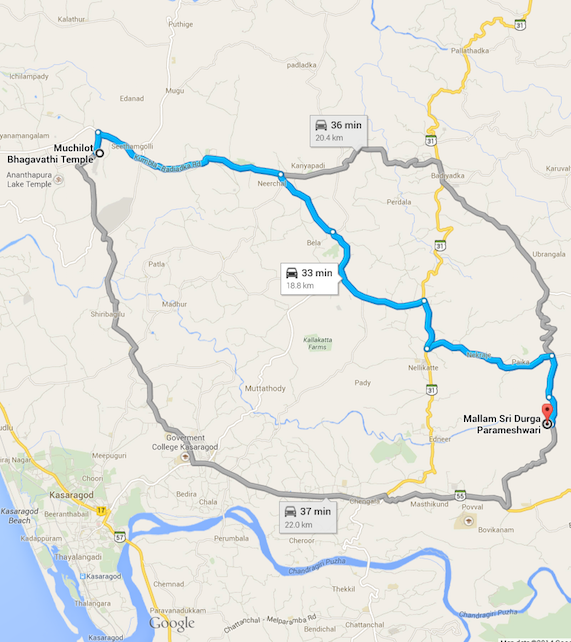 From Seethamgoli take a diversion towards right and travel four kilometers to reach Maipadi. Madhur temple is one of the most famous Ganapathi temples of six ganpathi temples of ancients Tulunadu. Devotees from all over visit during the various festivals that happen here. Devotees usually offer prayers to Mahaganapathi in the form of "Udayastamana". "Appa", Madhur's famous prasad, is a very tasty preparation.Among the special poojas that are performed, "Sahasrappa" (Thousand appas) is very prominent. It consists of making an offering of thousand appas. Another very special pooja that happens is MoodappamSeva which involves covering the Mahaganapathi statue with Appam. This is usually done on a community scale. Ganesh Chaturthi and Madhur Bedi are the occasions when the temple is at its busiest. 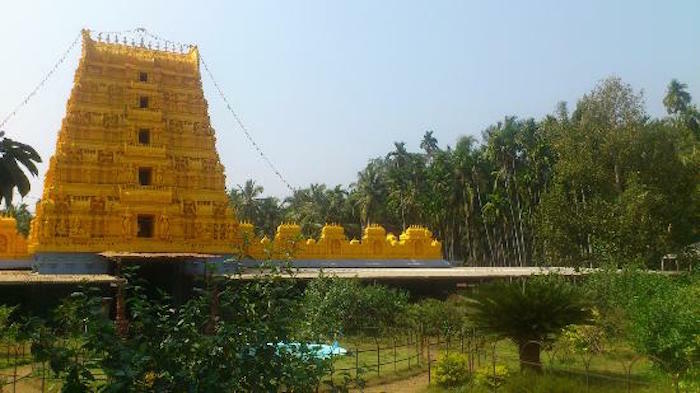 Sri Mujungavu Parthasarathi Krishna Deva Temple, Kanipura Sri Gopalakrishna Temple are few other famous temples near to Perne.